The demand for directional drilling department was significantly affected by the global oil prices downturn that started in 2014. The global Exploration and Production (E&P) companies responded to the oil price decline with budget cuts or project delays, with an expected overall 40% decline in CapEx spending. However, the pressing need for production optimization in the current ‘lower for longer’ oil price scenario supplements the demand for directional drilling, which allows drilling from a single rig in multiple locations and in areas where regular drilling activities remain as a challenge. Furthermore, rising demand to drill deeper and farther offshore, particularly in the unconventional reserve area, is expected to further supplement the demand for directional drilling services during 2018 – 2023 (henceforth referred to as forecast period). On the flip side, the oil & gas operators are expected to adopt a wait and watch policy based on oil & gas prices, for the commissioning of the E&P projects, resulting in a slight decline in demand for the directional drilling services. As traditional onshore reserves are depleting, offshore resources are expected to play a more significant role in securing the growing demand for oil & gas. The increasing interest in shelf resources is illustrated by the fact that over the past 20 years, the number of significant shelf discoveries has been higher than the number of significant onshore discoveries. The shelf production is expected to account for approximately 30% of the global output, with about 27% of the offshore reserve are below 300 meters and is expected to increase further deeper. The Middle Eastern countries are expected to invest heavily in offshore development to counter their declining onshore reserves and maintain global production share from the offshore fields. The rising investment for the development of the offshore oil & gas reserves is expected to supplement the demand for directional drilling services. The US shale investments were estimated to jump around 53 % in 2017, following a 44% plunge between 2014 and 2016, as per International Energy Agency (IEA). The shale gas production in the United States is expected to more than double from 37 Bcf/d in 2015 to 79 Bcf/d by 2040. Similarly, growth is also expected in Canada as well. To meet up with the rising demand for natural gas across the globe, E&P activities are expected to further increase, particularly in the North American offshore waters, such as US GOM region, which, in turn, would supplement the demand for directional drilling services during the forecast period. Despite facing constant stiff competition from the shale producers of the North American region in the midst of lower crude prices, Saudi Arabia is expected to register a moderate demand for directional drilling services, during the forecast period. The economy of Saudi Arabia is highly dependent on the oil & gas upstream sector, and the oil exports account for approximately 40% of the country’s GDP and 90% of the total export earnings. E&P activities in the country are expected to continuously remain high, particularly in the offshore region, thereby increasing the demand for directional drilling services. In July 2017, Saudi Aramco announced an investment of USD 300 billion in the oil & gas sector over the next decade, which is expected to supplement the demand further. January 2018: National Iranian Drilling Company secured directional drilling works for South Pars field phase’s 17/18 project in Iran. June 2017: Schlumberger awarded a multiwell contract for ISM operations in the Ororo field, including directional drilling services. Identify the drivers, restraints, and opportunity possessed by the global directional drilling market with in-depth analysis. 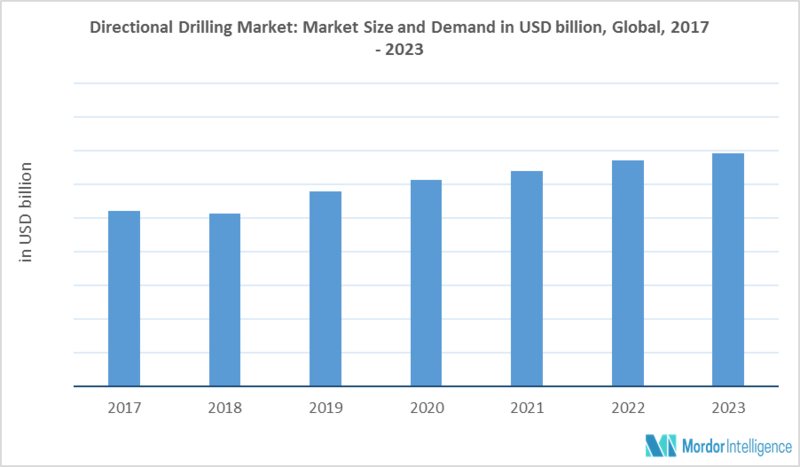 Gain in-depth market insights with forecasted market estimate in the global directional drilling market in terms of service type and location of deployment.